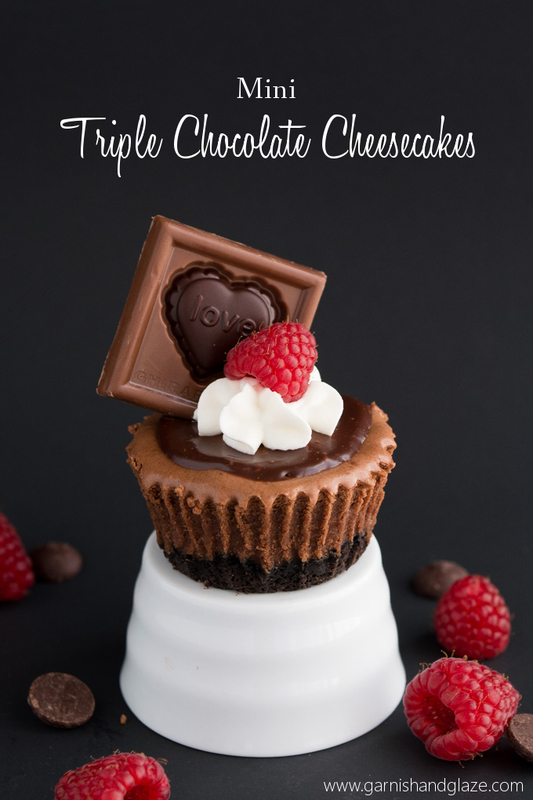 These rich, smooth, and creamy Mini Triple Chocolate Cheesecakes are the perfect way to say “I love you!” this Valentine’s Day. Valentine’s Day is just a couple of weeks away which means it’s time for all things pink, red, and CHOCOLATE!!!! It’s the holiday of love and also of destroying everyone’s New Year’s resolution to limit sweets/eat healthier/lose weight. But let me tell ya, these Mini Triple Chocolate Cheesecakes are WORTH IT! And they are also awesome because they are perfectly portioned in a muffin tin. With a big ole cheesecake it’s easy to cut a large slice and end up eating 927 calories. That’s the average number calories for a slice of cheesecake at The Cheesecake Factory… yes, I’m a nerd and just had to calculate it. With these mini cheesecakes you get a satisfying amount of rich chocolate cheesecake for just 363 calories (includes everything but that chocolate square) and you don’t have to sacrifice quality or taste. That’s about 1/3 the calories! Oh and it’s the holiday to celebrate the love you have for that special someone in your life… who probably really likes chocolate so why not show that chocoholic you really love them with something amazingly delicious?! My husband is a decent fan of chocolate but he will do anything for cheesecake and he is obsessed with these little ones. Our plans for V-day aren’t set in stone yet but I think it might consist of dining in and stuffing our faces with these mini cheesecakes. For a few years we’ve gotten PF Chang’s To Go so we’ll probably do that again too. Yeah, we’re too cheap poor to get a babysitter but going to a restaurant on Valentine’s Day isn’t the greatest anyway. Believe me, I worked as a hostess in high school and we marched people in and out of their tables like ants. 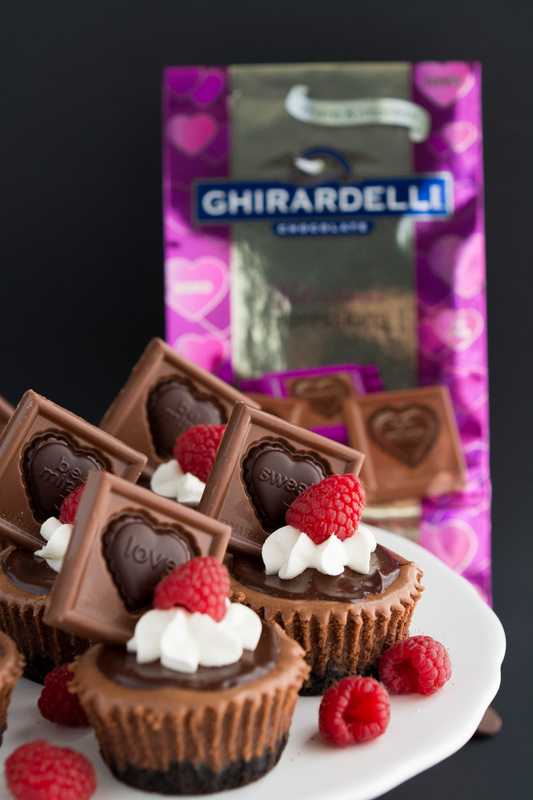 I love using Ghirardelli chocolate when I bake. It’s really an essential ingredient in any baker’s kitchen with its smooth texture and rich chocolate taste. Even my little toddler couldn’t resist stealing a few dark chocolate baking chip from off the table while I was shooting these pictures. 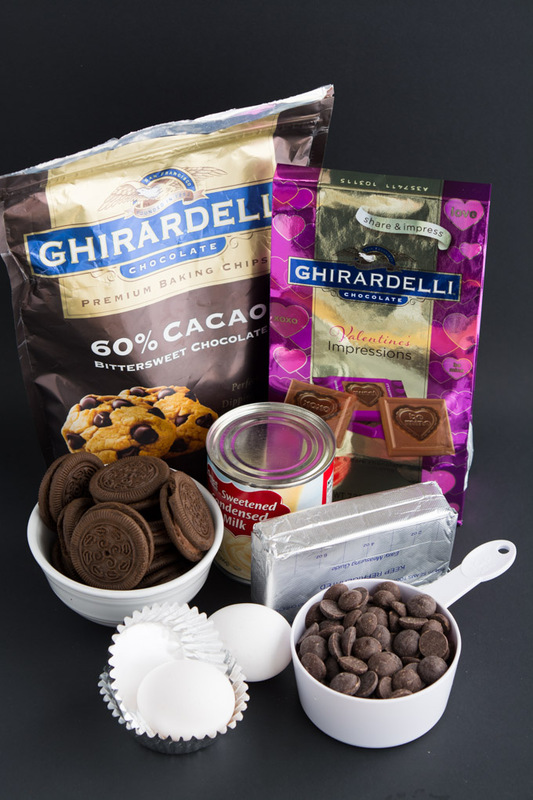 But for real, the Ghirardelli 60% cacao premium chocolate baking chips will ensure the best taste and texture to any baked treat. I use them not only in this cheesecake and ganache but also in cupcake batters and for hot fudge (recipes coming!). The crust of this cheesecake is simple, delicious, and CHOCOLATE! You just puree some chocolate cream sandwich cookies with a little butter and press it in some foil cupcake liners. The batter is actually quite simple too as long as you have the ingredients at the correct temperature. The cream cheese and eggs must be at room temperature. If you don’t have the patience to wait you can cut the cream cheese into chunks and microwave on low power until softened. The trick for the eggs is to put them in a bowl of warm water for 5 minutes. Easy peasy! So to start the batter you just beat the cream cheese until smooth, mix in the condensed milk, and then the melted chocolate. It’s important to get all the lumps out at this point before adding the eggs to avoid incorporating too much air (that contributes to cracks). Then just mix in the eggs one at a time until smooth. Look at how smooth and creamy the eggs make the batter. Makes you want to dip a finger in. Voila! 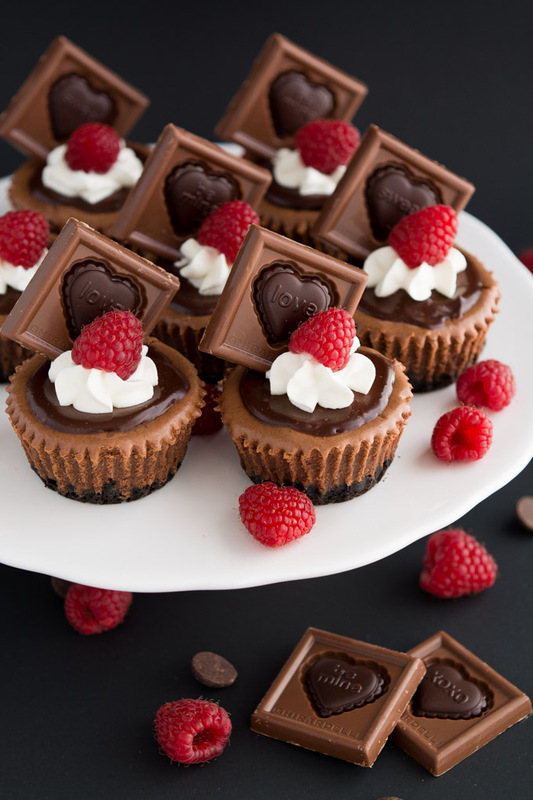 Perfect little chocolate cheesecakes. So so yummy! Oh and the great part about little cheesecakes verse a big one is that you don’t have to wait as long for it to cool/get cold. Just 30 minutes at room temp and an hour in the fridge. Finally, cheesecake you can eat the same day you make it! 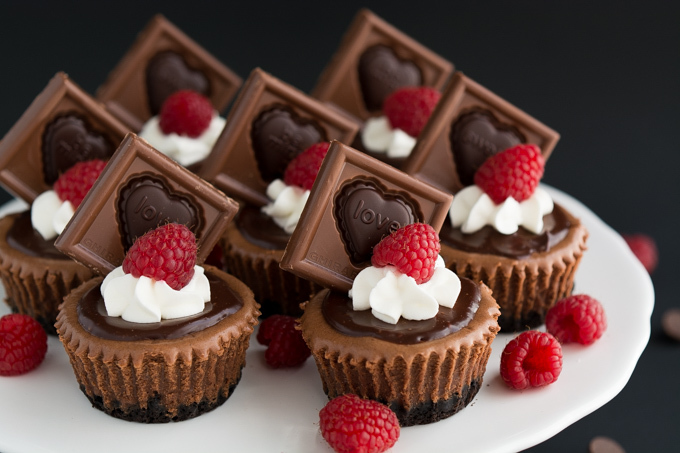 If you want to make these little cheesecakes super cute just stick some Ghirardelli Valentine’s Day Impressions Chocolate squares in. I love how they have the conversation heart messages on them (waaaaaaayyyyy better than those chalk tasting conversation hearts). 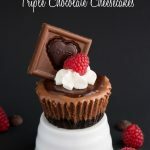 They are the perfect gift for that special one in your life just plain or on top of these scrumptious Mini Triple Chocolate Cheesecakes (I highly recommend you make them)! Preheat oven to 325 degrees F. Line a muffin tin with foil cupcake liners. Place cookies and melted butter together in a blender and puree until no large chunks. 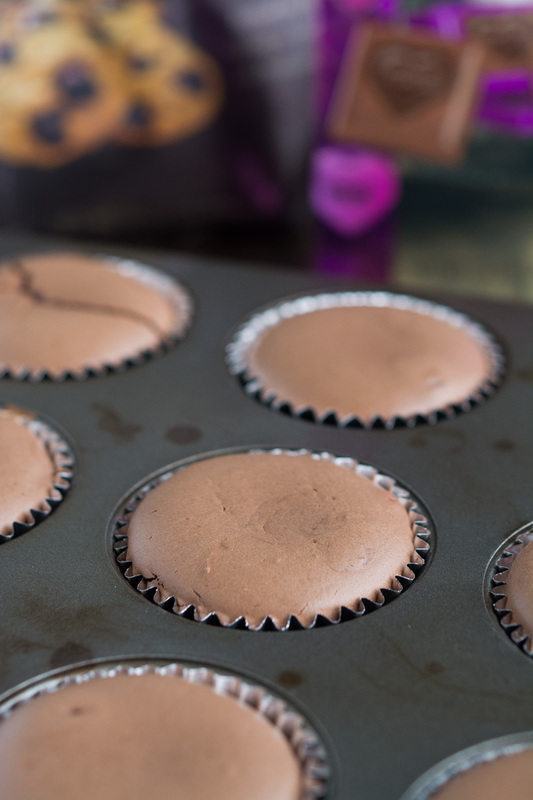 Divide among cupcake liners and press the crumbs firmly in the bottom of each. In an electric mixer, beat the cream cheese until smooth. Mix in the sweetened condensed milk, melted chocolate, and vanilla and beat until combined and smooth. Beat in the eggs one at a time until evenly mixed. Spoon batter into liners dividing it equally among all 12. The batter should be almost to the very top of the liner. Bake for 15-18 minutes until set (it won't jiggle when you shake the pan). Let the cheesecakes cool in the pan on a cooling rack for 15 minutes. Remove the cheesecakes from the pan onto the cooling rack and cool another 15 minutes. Move the cheesecakes to the fridge and refrigerate for 1-2 hours until cold. Gently remove the foil liners and top with ganache, whipped cream, a raspberry, and a chocolate square. Place chocolate in a bowl. Microwave whipping cream and pour over chocolate. Let it sit for 2 minutes and then stir until smooth. Spoon about 2 teaspoons of ganache onto the top of each cheesecake and spread to the edges. These look so delicious Melanie! You’re seriously so talented! I’m not sure they’re and equal substitution but a peanut butter version is a recipe I’ll work on. Thanks Kimberly! Hope you get a chance to try them. These are gorgeous! I LOVE the Cheesecake Factory but the pieces there are so ridiculous — I love that I can have my chocolate and eat it too! Exactly Ashley! Maybe I should pitch to the cheesecake factory to start offering mini portions. Man these cupcakes look so incredibly decadent and delicious – I can’t think of anything more I’d rather in indulge in on Valentine’s Day either. Wish we had those little chocolate squares in Australia too.. they are so cute! Bummer Thalia. I wish that all food was available worldwide. I know you can order them online but you’ll have to check if they ship to Australia. But even without the chocolates these are divine! Haha! Yep! They’re real all right Oana. And I totally agree, perfect for any/every occasion! These mini cheesecakes are so adorable I could just pinch them. ..or eat them. . .or pinch them, then eat them. And with the will power of steel, I wouldn’t have to worry about eating them given they are perfectly portioned unlike that sinful Cheesecake Factory cheesecake. haha! Tell me about Lynn! Cheesecake Factory Cheesecake is dangerous! Once you eat half a slice and feel satisfied the remaining just stares you in the face begging to be eaten… and wins. Your photos are gorgeous! And these are so beautiful and perfect, pinned! They look so adorable!! And I love the idea that they are small portioned. Azu- Besides it being delicious, the small portion is my favorite part. Cutting a small slice of cheesecake is next to impossible so these are perfect! These are gorgeous! Almost too pretty to eat! Thanks Miranda! So true… but after one little bite you can’t stop yourself from eating the rest. Olivia- You can use the picture and ingredient list but please do not post the directions. Link to my instagram profile and website to get the rest of the recipe. These are delicious and very easy to make!! Thanks for sharing! Angie- I’m so glad you like them as much as we do! That’s a great idea to substitute peanut butter chips. You can also sub white chocolate chips too. Yeah, whipped cream doesn’t always keep well. It actually did fine for me but I used homemade and whipped it pretty thick. Yes, but wait to put the whipped cream and berries on until right before serving. This recipe looks amazing, but are you using a regular muffin tin or a mini muffin tin? And if I wanted to use a mini muffin tin could I just halve the recipe? Amy- Yes, I use a regular muffin tin. 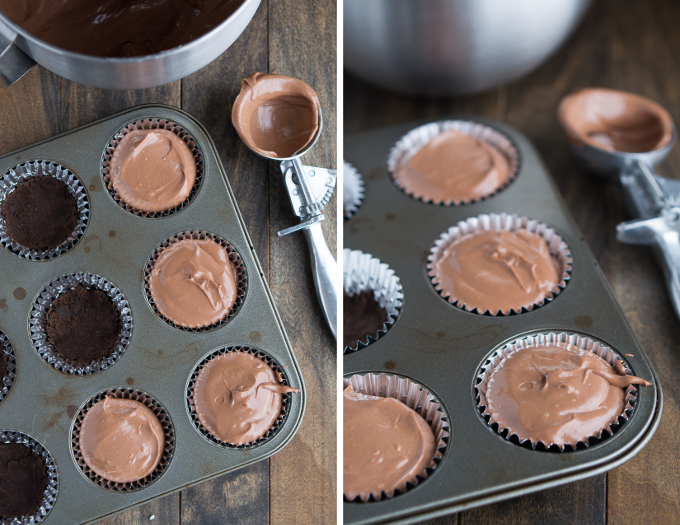 I haven’t made them in a mini muffin tin (what a good idea!) but my experience with mini vs regular tins is that the well of the mini tin is a third the size of a regular so if you just made the recipe as is you would get 36 in mini muffin tins. You will need to reduce the cooking time though I’m not sure by how much. I would say they might need 10-15 minutes. Hello – I made these as mini muffins. I doubled the crust recipe and kept the cheesecake filling the same and it made about 48 minis. I doubled the ganache but didn’t need to. I am taking half to a friend’s house tonight and freezing the rest. Thank you for this recipe – it is outstanding! Can these beautiful little cheesecakes be placed in the freezer minus the cream and raspberries? Sharyn- I’ve never tried freezing them but I’m sure that would work as long as you defrost them by placing them in the fridge the day before or just on the counter. I don’t think you’d want to microwave it. Let me know how freezing it goes. So delicious. Made these once before and everyone loved them, so I’m back here again for the recipe to make for a party! Froze a few individually wrapped in foil, omitting the berries and whipped cream. They tasted just as delicious straight out of the freezer with whipped cream on top! That is so good to know!… and also dangerous. haha! I’m going to have to start freezing them. Could these be baked in a small jelly/jam mason jar? They are adorable! Cherri- Of course! What a great idea! I’ll have to try that. 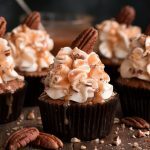 These Triple Chocolate Mini Cheesecakes look heavenly! I love the presentation and can’t wait to try out this recipe! A perfect treat for Valentine’s Day! This recipe is fantastic. I unfortunately couldn’t get a hold of ghirardeli chocolate chips, but used Hershey’s semi sweet ( international export quality ones- not the ones on US. The exported ones taste far better). Anyway it was easy to make, sinfully delicious and I got lots of compliments. Needless to say all 12 were wiped out by the end of the night. Thanks for Shari g this recipe. Will be making it again hopefully with the ghirardeli chocolate chips if I’m able to get them in Dubai. I am making these mini cheesecakes for a dinner party.. if I freeze them with out the whipped cream should i freeze them with the foil papers on them? removing them after defrosting? Joan, I’ve never tried to freeze them but I’d wait to remove the foil until after defrosting. I don’t normally leave reviews but thought I had to for this recipe. I’ve made these Cheesecakes countless times now and they are perfection ever time. My friends have even commented that they’re better than any restaurants!!! In place of the chocolate square, I just make dark chocolate hearts. Many thanks for this beautiful recipe and the stunning photographs. 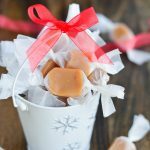 I made these last week and am about to make them again! This recipe was the best i have tasted yet and so easy and turned out perfectly! i doubled the recipe and they were all gone in one day! everybody asked me to make them again! like some others i never leave reviews but had to for this recipe! These tasted beautiful thank you for sharing! Made these for Valentine’s Day treats for the family. They were so easy to make and VERY tasty! Thank you for the recipe! HI, I have made these mini cheesecakes countless times and they are absolutely delicious and have always been a hit and they are so cute! 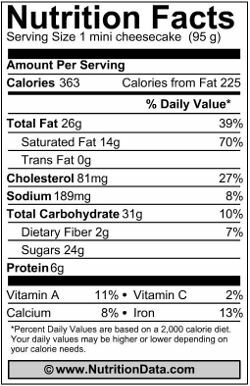 Do you have the cooking time and ingredients amount if I wanted to make it a standard cheesecake size? I’m going to make these, but when putting the ganache on, should they be served right away?? I am making these the day before they’re served, so if I put the ganache on and store in the fridge, with the ganache be ruined?? sorry if a silly question, I’ve never used it before :O Making them Friday for an event Saturday. Sorry I’m just answering this Erin. Ganache is totally fine to apply ahead of time. It’s the whipped cream on top that loses the air in it that should be applied just before serving (or a couple hours before). Do you put the cookie part in the oven for a few minutes before adding the rest? Nope. Just follow the directions as written. I made these cupcakes for a dinner party last night and I have never had such an amazing response to a dessert. 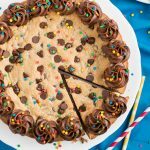 Several times my guests said this was the best dessert they had ever had.Thank you for posting this recipe! I have made these for our work Valentine’s party the last two years. They are as amazing as they look. Everyone fights to take an extra home. Love this recipe and highly recommended it. Definitely a show stopper.